“Treasury is not truly in touch with the reality of Americans abroad. Foreign corporations owned by Americans abroad exist in abundance. They are an everyday fact of life,” added Serrato. ACA believes that it is fundamentally wrong for the Treasury Department to write regulations without knowing who is affected, and to what extent, as this goes against the fundamental requirements of the RFA. The point is that small business people are the same inside the United States and outside the United States. The single most important characteristic is that from an economic perspective the corporation is a structure that is generally created to achieve limited liability or some other local benefit. I tip my hat to the S Corporation America. I have NO DOUBT that their lobbying and organization secured a “transition tax exemption” for S Corporations. (i) S Corporations are legally corporations but really business entities which are used by individuals who are operating small businesses. (the IRS requirements to qualify as an S Corporation reinforce this.) The S Corporation for practical purposes IS the individual. (ii) Sec. 965(I) creates a transition tax exemption for S Corporations – and therefore is creating a transition tax exemption for individuals who have decided to create an S Corporation (but remain taxed as individuals). (iii) If the principle is that individuals should be subject to the transition tax then creating an S Corporation should NOT justify a transition tax exemption for individuals. (iv) If the principle is that individuals should be exempt from the transition tax then ALL individuals (including Americans abroad) should be exempt from the transition tax even if they are individuals who use an S Corporation. (v) Individuals in general should be treated the same whether they form an S Corporation or not. (vi) In conclusion: Since individuals who form S Corporations are exempt from the Sec. 965 transition tax then individuals who live outside of American and have small business corporations should be exempt from the Sec. 965 transition tax. 8. Should Americans abroad who don’t renounce U.S. citizenship consider using U.S. Corps to own and operate their businesses abroad? Congress does not care about Americans abroad and does not care that it doesn’t care! Congress does listen to the S Corporation Association of America! Legislation in America (as Conrad Black once said) is: A pay to play casino. Practically speaking, what should those Americans Abroad with neither representation nor lobbying do? Part A is here . 1. What exactly is an S Corporation? The following tweet referencing an excellent article from Wolters Kluwer explain this point. The first thing to remember is that an S corporation is simply a for-profit corporation that elected to be taxed under Subchapter S of the Internal Revenue Code, making it a “pass-through” entity for tax purposes. It is incorporated under and governed by the same state corporation laws as a corporation that was not eligible for S corporation tax status or whose shareholders chose not to elect that status. Therefore, an S corporation has the same non-tax advantages as a regular corporation. (A regular corporation is also referred to as a C corporation when discussing its tax status because it is taxed under Subchapter C of the Internal Revenue Code). Because an S Corporation is a corporation with a specific kind of tax treatment (the profits are passed through to the shareholders), one can say that an S Corporation is really a creation of the Internal Revenue Code (On The Third Day Congress Created The S Corporation). Since the S Corporation is a creation of the Internal Revenue Code, we look to the Internal Revenue Code to learn the requirements to be an S Corporation. The S Corporation is defined in Internal Revenue Code Sec 1361. For purposes of this title, the term “S corporation” means, with respect to any taxable year, a small business corporation for which an election under section 1362(a) is in effect for such year. For purposes of this title, the term “C corporation” means, with respect to any taxable year, a corporation which is not an S corporation for such year. (D) have more than 1 class of stock. It is clear that this does not and could not describe a large publicly traded corporation like Google or Apple. Notice also that S Corporation shareholders cannot include nonresident aliens. An S Corporation is designed to provide the corporate benefits of limited liability coupled with the simplicity and tax benefits of being taxed as an individual. A few years later, Republican President Dwight Eisenhower found himself under fire from the Democratic Congress for practicing “trickle-down economics” and favoring big corporate interests over the little guy. At the same time, Republicans and Democrats were increasingly alarmed that too much economic power was being consolidated into the hands of a few wealthy, multinational corporations. This economic centralization was characterized by economists like John Kenneth Galbraith, who saw America’s economic future as a grand balance of power between Big Labor, Big Business, and Big Government. Private enterprise was viewed as a thing of the past. They were required to be a domestic enterprise; They were required to have a limited number of shareholders; They were limited by who those shareholders could be; and They could have just one class of stock. This post is in 3 parts, published over 3 days. On November 15, 2018 I did a second interview (first interview October 16, 2018 here) with Monte Silver and his Sec. 965 advocacy. The video was featured on a post at CitizenshipTaxation.ca. This interesting exemption is available only to individuals who are shareholders of S corporations and not to other individuals. The interview also included some discussion of the fact that “S Corp” shareholders have the benefit of lobbying from a powerful lobbying association – S-Corp. The interview ended with Monte Silver describing the probability that the Sec. 965 transition tax issue is headed to the courts. Why are individuals who are the shareholders of an S corporation, which owns the shares of a CFC, more equal than those individual shareholders who own the shares of a CFC directly? The US wants to “raise funds” by imposing taxation on the undistributed earnings of Canadian Controlled Private Corporations. Lawyer Monte Silver needs to “raise funds” to stop them. You can help! Below is a summary of the advocacy effort since June 2018, and a description of the road ahead. For the first time since we began this advocacy, donations are required to enable us to proceed. I am also making myself available until December 15 to assist on Transition tax matters, in exchange for donation to the cause. 1. Many American small businesses have until December 15 to file their 2017 U.S. tax return with the Transition tax attachments. 2. Many American small businesses have paid some Transition tax and will pay more in the coming 8 years. 3. A huge number of American small businesses must comply with GILTI every year from 2018 onward. The first part of this email discusses developments since June till today. The second part focuses on next steps. On June 4, due to our efforts, the Treasury granted small businesses with less than $1M in transition tax liability a one year extension to make the first payment of the tax. Since that time my focus has been to secure small businesses – both U.S. and foreign based – permanent relief from the two taxes. As set forth below, the attempt to resolve the exposure of American small businesses (abroad and in the US) to the Transition tax and GILTI by friendly dialogue appears to have fallen on deaf ears. Congress-facing activity: In June 2018 I met with senior staff of 37 members of the Senate Finance Committee and House Ways and Means, and engaged in extensive follow up. One Senator’s office was kind enough to produce a draft bill to exempt small businesses from the Transition tax. However, that office made clear that there was no support for the relief among any members of the Senate Finance Committee he talked to. In my opinion, Congress will not grant small businesses any relief from these taxes, even in the lame duck session. Treasury-facing activity: In August 2018, Treasury issued proposed regulations for the Transition tax. In October 2018, Treasury issued proposed regulations for the GILTI tax. After investing hundreds of hours reviewing these proposed regulations, researching various procedural laws and talking to relevant US legal experts, I conclude as follows: in issuing these proposed regulations, Treasury seriously violated at least 3 federal procedural laws – (i) the Regulatory Flexibility Act (RFA), which expressly gives Treasury the authority to exempt small businesses from the Transition & GILTI taxes; (ii) the American Procedure Act (APA) and the Paperwork Reduction Act (PRA). These violations give small businesses the specific authority to sue Treasury in a relatively expedited proceeding, and the courts have the specific power under these laws to provide small businesses effective relief. Since August, I have repeatedly sent Treasury Secretary Mnuchin and senior officials at Treasury/IRS and other agencies well-thought-out analysis citing clear-cut Congressional reports, legislative history and case law all supporting my claims. I asked that a compromise be reached in order to put this matter to rest. But Treasury simply ignored my analysis, or at best simply concluded without any explanation that these laws did not apply to the proposed regulations, At this point, and based on written and oral feedback from senior government officials, I have concluded that Treasury will not grant small businesses any exemption in the proposed regs. There are five options, which can all take place in parallel. The first four involve me helping individual small businesses lawfully avoid Transition/GILTI taxes. The fifth option, which will seriously enhance options 2-4, involves suing the Treasury for violating three federal laws and getting the court to give us relief. 1. Very small businesses with little Transition tax liability that have yet to file 2017 returns: Until now, on a pro-bono basis I have helped many people who needed to file their Transition tax returns but did not know how to do so. I will continue to do so until December 15, in exchange for an agreeable donation to the cause. 5. Litigation. A lawsuit against Treasury/IRS to get the court to provide small businesses relief from these two taxes. I have every intention to immediately file this lawsuit and aggressively fight this in court. Independent legal experts and I strongly believe we will win, otherwise I wouldn’t even consider this option. And the laws provide for a relatively expedited legal proceedings. I have identified a highly experienced DC-based boutique law firm which has done battle with Treasury and won. The firm likes the case. ITS ALL ABOUT THE DONATIONS. Costs of litigation can be kept low by me doing part of the work at reduced rates (yet no longer completely pro-bono given the time involved). * As to options 2-4 – please contact me for details. Such an opinion must be discussed in detail before any decision is made, and will be impacted by the final regs which will be out shortly. In any case, portion of the fees generated from these three options will help fund litigation is sufficient donations are generated. (iii) via a wire to a bank account. All donations will be kept confidential. Furthermore, if you wish to be named as a party to this litigation, let me know. Together we have achieved two wins from Treasury and brought broad awareness to our cause. I have every intention of continuing the battle and winning. Together (and only together) we can do it. A series of information sessions (some formal presentations and some informal discussions); for information concerning the content of the programs please see here. John Richardson is a Toronto citizenship lawyer, the co-chairman of the Alliance for the Defence of Canadian Sovereignty as well as the Alliance for the Defeat of Citizenship Taxation. He is a member of the ACA Taxation Advisory Panel. He holds the degrees of B.A., LL.B., and J.D. He is a member of the Massachusetts, New York and Ontario bars. His law practice focuses on “Solving the problems of U.S. citizenship” including relinquishing and the “Exit Tax”. He gives programs for expats (and Green Card holders) all across Canada and Europe. He writes extensively at citizenshipsolutions.ca. Karen Alpert founded the website Let’s Fix the Australia/US Tax Treaty and its associated Facebook group. The purpose of the group is to lobby and educate the Australian government regarding the impact of extraterritorial US laws on Australian citizens and residents and the cost to Australia of surrendering its sovereignty in these matters. Karen has a Ph.D. (UQ, Finance) and lectures in Finance at the University of Queensland. Kings Cross train station is within walking distance. Bus route 311 stops on Macleay Street, near Orwell Street. Bus routes 323, 324, 325, 326 and 327 stop on Bayswater Road, near Darlinghurst Road. Kings Cross parking station is nearby. Information presented is NOT intended or offered as legal or accounting advice specific to your situation. Legislation that its proponents say would significantly improve the lot of American expatriates, many of whom have been left reeling by the Trump tax reforms introduced at the end of last year, will be introduced in Congress before the end of the month. 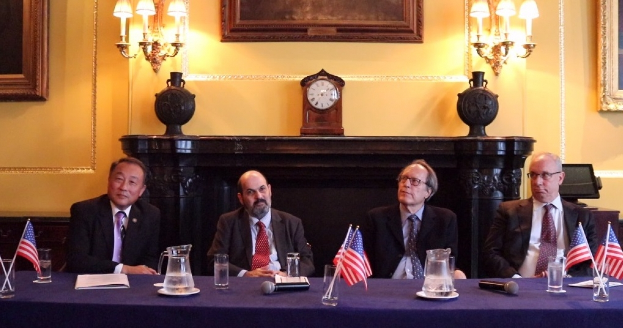 This was the message delivered to a London audience of around 80 mainly expatriate Americans last week by Republican Overseas global chief executive Solomon Yue, (pictured above, far left, and below), and again a few days later to an also mainly expat audience in Paris. Today Yue is due to bring his message to expats in Frankfurt, with similar events scheduled for Berlin and Rome over the next few days. Yue’s appearances were his latest on a global whistle-stop tour of key foreign business centers around the world that aims to rally support among – and ideally as well, the active involvement of – American citizens living abroad for legislative changes in the way their country currently taxes them, in the run-up to the midterm elections in November. Repatriation Tax/GILTI – Negotiate for an Exemption? Americans against the Repatriation/GILTI taxes – within striking distance of winning and you can help! And what to do with the October 15 filing deadline? On August 1, 2018, the Treasury issued proposed regulations that interpret the Repatriation tax law – a 250 page very complicated document. I discovered that in issuing the document, Treasury seriously violated numerous Federal laws and procedures. This gives us tremendous leverage in negotiating for an exemption from the Repatriation & GILTI laws. It is not unreasonable to expect that this battle may be won by December 15, 2018. As you many have an October 15, 2018 filing deadline, I attach a relevant portion of an IRS publication stating that you may be able to extend the filing date until December 15, 2018. I suggest that you discuss this with your US CPA specialist to see if this applies to you. What can you do to help win the battle? Easy! We need impacted Americans abroad and in the US to send in a few short paragraphs (as outlined below) – by October 7! See below for instructions. If you or people you know are impacted by these laws, lets take care of business! We are within reach. Lets do it. Do not include any identifying information about you or your business. Do not even say whether you live in the U.S. or abroad. You need to customize the letter where marked in red!!! Do not discuss anything but the Repatriation tax, and 962 if relevant for you. Submitting your comment: You can submit directly at www.regulations.gov/comment?D=IRS-2018-0019-0001. This Federal site does not require you to identify yourself. If you want to remain 100% anonymous, send the comment to me and I will submit it in an anonymous batch with others. To see other comments, including my own, click “Open Docket Folder” on the above link. I am a U.S. Person with an interest in a small business. As a result of the Repatriation tax, and now these Proposed Rules, 2018 has, and the foreseeable future will continue to be, a nightmare for me, my business and my family. (ii)The Repatriation tax and this proposed regulation have and will continue to devastate my small business. Issue 1: Countless hours I have spent and still have to spend trying to deal with the Repatriation tax. Issue 2: How the Repatriation tax has devastated my small business. (i) money – paying tax professionals, taking money needed for the business out of the business to pay the tax. you have no idea whether the proposed rules mean that you have to amend returns, which will double the cost of compliance and headache. Non-Americans do not want to co-found businesses or have you as an investor, given the headache of Repatriation/GILTI taxes involved. Based on the above, I respectfully request that Americans with small businesses be exempt from the 965 tax. Posted on September 13, 2018 September 13, 2018 Categories GILTI, Transition TaxTags CCPCs, CFCs, extra-territorial taxationLeave a comment on Repatriation Tax/GILTI – Negotiate for an Exemption? This piece is a report of an article by Helen S. Cheng and Dina Y. Name of Withers Bergman LLP by was originally published in the November 13, 2017 issue of Tax Notes. In theory, surrendering your U.S. citizenship for tax purposes can be expensive. However, the IRS sometimes has difficulty enforcing the exit tax against expatriates. Now the State Bar of California is recommending legislative changes that would make enforcement easier and expatriation more expensive. Once an exit tax is assessed, the IRS has authority to place tax levies on the person’s domestic accounts, but has limited authority to collect the amount owed from any property held overseas. To correct this, the State Bar of California’s proposal recommends that the U.S. legislature amend the Internal Revenue Code and related laws to close the information gaps and improve communication between the departments. The proposed laws, if adopted would essentially change the order of filing, requiring a U.S. taxpayer to complete Form 8854 and pay the exit tax before completing expatriation through the State Department or Department of Homeland Security. They would also allow the departments to exchange information about expatriating taxpayers, to the extent necessary to enforce the exit tax. In addition, the Bar recommends requiring expatriates to consent to ongoing personal jurisdiction in the U.S. for five years.This would allow the IRS to seek enforcement in U.S. courts, rather than filing tax collection matters abroad. I haven’t seen anything else about this idea and have no knowledge that it has gained ground. However, were this to happen, presuming those who can remain under the radar will continue, those who need to renounce may find it a lot harder………. Panel discussion with John Richardson, Solomon Yue, Olivier Wagner and Jim Gosart.